Well, I knew it would happen eventually. The pull of the beautiful weather would call me to my garden, and that is where I have spent most of the last week. I was able to clean up some of the garden beds, although I still have several to work on, which hopefully will be done by this weekend. Yesterday, however, it was rainy and gloomy. That is perfect knitting weather for me! 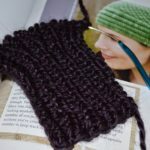 So I sat down to work on the second wristlet, which will now not be needed until next fall, but at least I can set them away and know they are available to give as a gift! I am still working on that one silly sock. And when I say working, I really mean thinking about working on it. I need to take a bit of time to figure out how to finish off the toe when I don’t have my stitches on the right needles in order to follow the pattern. I know it won’t take much to figure it out, but having a little quiet time in order to think is hard to come by recently! I will get to it eventually. 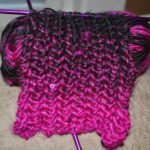 And while I talked about trying to finish up my projects on the needles, I was thinking about knitting up some dishcloths. I love to knit them up because they are quick, we use them, and I can try out all kinds of pretty patterns. 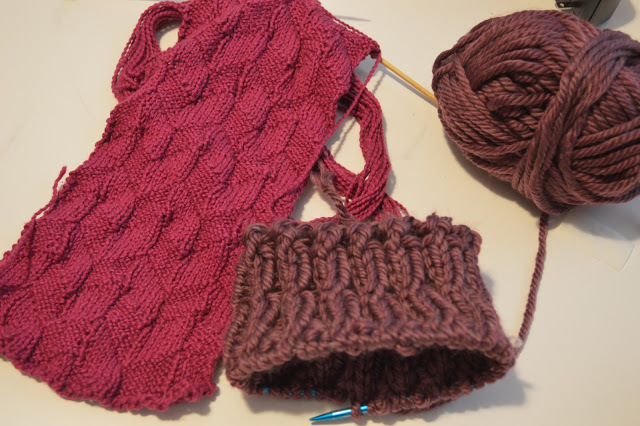 I plan to finish the wristlet first, but then, then I will probably cast on for a dishcloth. As far as my reading goes, I am still reading Faith Unraveled. I’m not sure how I feel about it yet. I am not very far in, maybe 20%, and I can’t figure out the author’s tone, whether it is really negative, or if what she says I just disagree with. I will plow on, because I would like to finish it, it is interesting, but I had to look for a different book too. 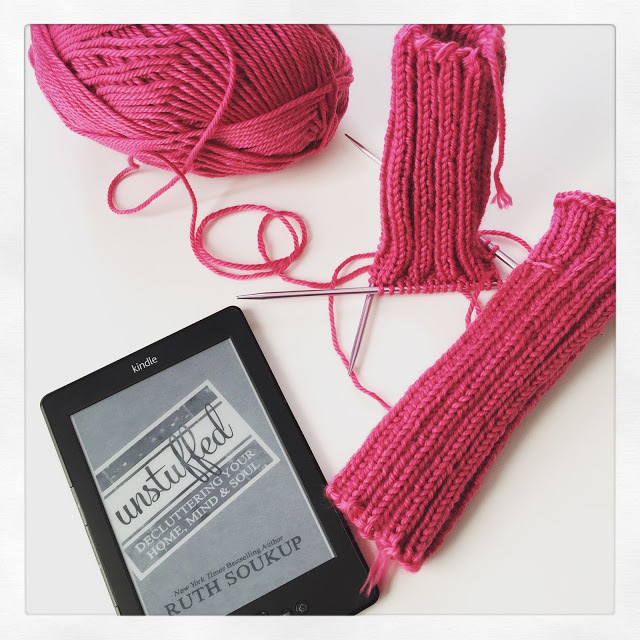 I came up with Unstuffed by Ruth Soukup – all about decluttering your life. A book right up my alley! She is also the author of Living Well Spending Less which I read last year and loved. Is the weather pulling you outside? Do you finish books even if you don’t really like it? I've always said reading on an eReader is one of the hardest things for me to do. I'm used to the smell of books and turning the pages. But I recently downloaded a Kindle version of a friend's book to support her, and I went through the entire book in two days. Worth every penny! Sort of the opposite here. The weather is cooling down a little, and that's making me more likely to head outside. The sun here has been absolutely fierce. Ahhhhhhhh I use to be so into knitting!!!!!! Your post makes me want to get back into it! It was so relaxing to just zone out and create fun things! Sounds like a good read to add into my summer reading list, which is ever growing! I need to read this! I need to unclutter my life in a huge way! This sounds perfect for me! 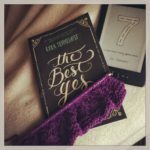 I love Ruth's blog–I may have to check out her book. Thank you for letting us know about such a great book! We always say in the Chicago winters we are going to learn to knit. It hasn't happened yet. One day we will, seems like such a peaceful hobby. I love the color of your wristlets. I have never heard of knitted dishcloths. You will have to post pics of those when they are done. I am totally intrigued. We have had a couple of gorgeous days and then today was hit with rain – but I won't complain, because we do need spring rain! I wish I knew how to knit – I just never learned. I took my daughters to some classes and they sort of learned, but never quite picked it up. Our weather has been absolutely lovely here in South Florida and I'm also excited to read Unstuffed! Ruth is a wonderful person and a fabulous writer! I have to love a book to read it… which is why I dont read a lot. Lol. But yes, the weather is already like 80 here so now we try and be outside whenever possible. Love the book recommendations. I need to read that one. I don't want to read the other popular decluttering book as it seems a bit kooky. Good luck with your knitting projects. I was just thinking about starting Unstuffed! And maybe crocheting. its be a while! I don't knit but I love knitters! I am so intrigued by how your hands work! I cannot get this for the life of me. So I happily purchase! I don't know how to knit but it reminds me of my grandfather who always knit during the winter. He made me socks when I was eight years old that I still have today. I'll give them to my daughter when she's old enough. I cherish everything he ever made for me. 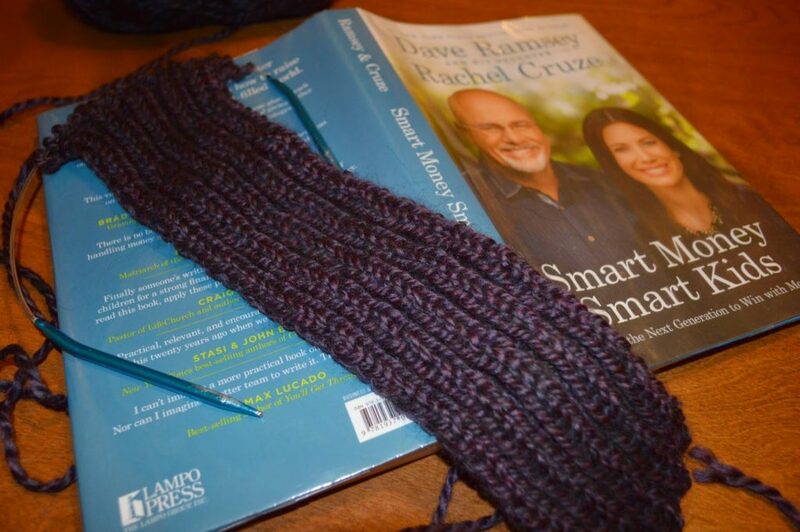 I want to learn to knit and will attempt it one day… but right now I am crazy swamped with other stuff. 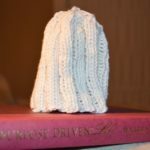 Love the finished products of cozy knitted items! It's true: nothing is better than a rainy day for knitting! I'm going to download Unstuffed to my Kindle today. That looks the exact book that I need right now. And, no, life is to short to finish books I'm not enjoying. The weather is definitely pulling us outside! I am also excited to read Ruth's book, Unstuffed!! I am working on socks too, in fact, three pairs! Socking knitting seems to be all I can think about. I use to finish books even if I wasn't enjoying them, but a few years ago I quit. Life is short and there are too many good books out there to waste time on something that isn't bringing joy. There are affiliate links in this post. If you make a purchase through one of these links, I will receive a small commission at no extra cost to you. Thank you for supporting this blog! adjust our daily rhythm throughout the year. what I feel I need to accomplish in the day as well. 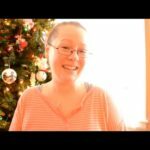 I love – The Rhythm of Family by Amanda Blake Soule. actual neck warmer that you can wear outside to play in the snow. I am planning on giving this to Emma. a few days ago, and plan to dive fully into de-cluttering today. It was an interesting book that is for sure. definitely getting down to the wire! made your book list recently? Previous Post: « To Be In the House or Out of the House – That is the Question! So much productive knitting and reading. Good for you! I tend to be very productive in the winter and not so much in the summer. Lovely knits!!! I love the textures on your knits! I really want to try popsugar must have! I've tried fab fit fun and didn't like it very much. I do a lot of needle work, but I don't know how to knit. I would love to learn this. I just finished reading We Were Liars, it was a fiction, easy read so perfect for a wintry afternoon! I am listening to the Life Changing Magic of Tidying Up and must admit, it is a little scary and daunting. I like the idea of living more simply with fewer things but just finished listening to the part on getting rid of books and, though I know I will probably never read them a second time, felt like purging them would be like letting go of good friends….sigh. I hope you blog about your progress as you implement some of the principles in this book. I really enjoy Lauren Winner's books. I remember picking that up more than a decade ago and the cover put me off, as well as the kind of lame book reviews, but I started it and liked her perspective. Not all of her views and positions are the same as mine, but seeing Christianity through her eyes was helpful. Your knitting is lovely, too, by the way. I love popsugar must have boxes! I'm going through yoga teacher training so all of my reading right now is yoga books. Love it! This week I have been practicing patience. LOL, I don't know if that really answers your question, but in addition to interviewing Danny Wood on my podcast, I had to really focus on not feeling rushed and crazy for the other things in my life. to be able to have the patience to sit down and knit is on my bucket list. i WILL get to it one of these days as your creations are so much fun! Sounds like a very interesting book– I haven't heard of it before. I too, am trying to embrace the bitter cold months. I've found that I don't want to hear my kids say, "I hate winter" or something like that. 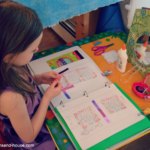 I want them to learn that there are great things about each season– and if I want them to think that, I need to model that! What a fun cowl! I envy your ability to knit every single time I read one of your posts! I have been dying to learn how to knit! It looks like such a relaxing hobby! This month by goal is to finish The Night Circus. So far it's great! At the moment I am reading Suzanne Dunnes 'Lady of Misrule' a historical fiction of book set at the time Lady Jane Grey was imprisoned in the tower. 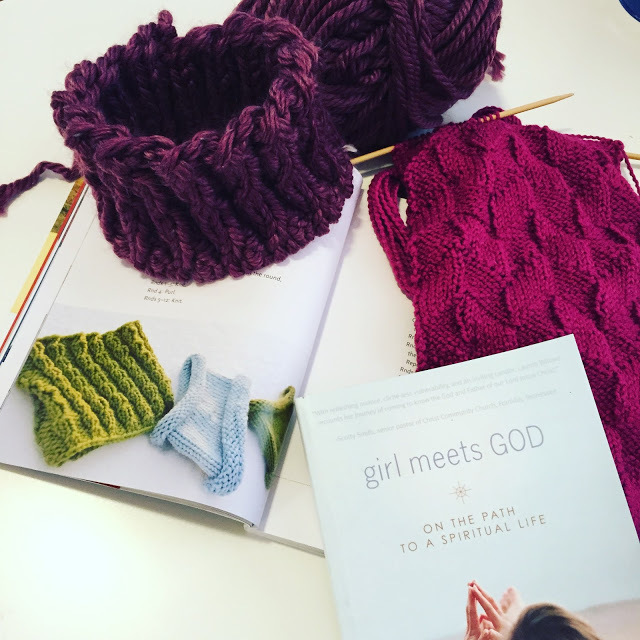 I've always loved the idea of knitting – calming, focused, deliberate. Your work is beautiful! An actual neck-warmer! That looks lovely, what a great seasonal project. I will have to check out the Rhythm book. 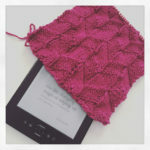 Pretty pretty knits! I strive to live seasonally, too, but sometimes it can be hard. Have you watched River Cottage? It is hard to find it online and the DVDs on sale on line are not programmed to play on US DVD players but now and again it will pop up on Youtube somewhere. That show completely changed how I feel about food, my garden, and the seasons. You should check it out! 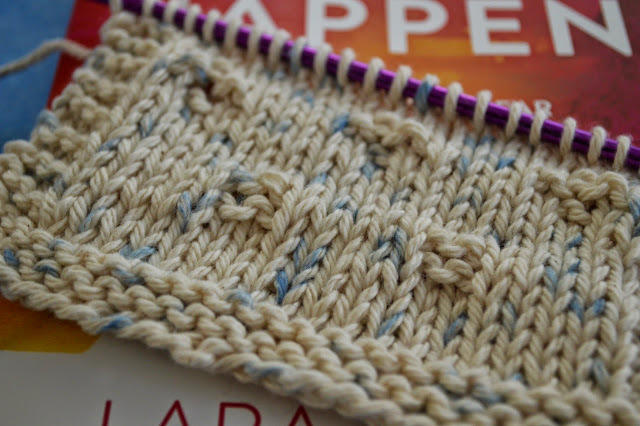 I wanted to start out the year good with more knitting but…sigh…not doing so well. I am knitting Romi's Bluebird stole which is very pretty however I keep starting it over because I am not happy with my knitting in lace weight. I think I may be expecting to much stitch perfection for the yarn. I am also trying to read all of Jane Austen's books this year and I am starting with Sense and Sensibility. I read it many years ago and am really enjoying it again. I love the colors of your yarns!!! They brighten up the month of January!! Yay for projects you can finish quickly! I am also wanted to create more this year and so far so good – that books looks good as well. Enjoy this day. That looks like an interesting book, I'm going to look for it at the library. Beautiful projects. I'm waiting for Spark Joy from the library. Your yarns are beautiful colors. I too am trying to live and enjoy each month and all it offers, and for my winters that is great, it's the summers that wear me down. 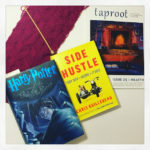 I have all of Amanda's books and after reading your post I think today would be a good day to pull them from the shelf! Rhythms change so much with the seasons and it sometimes takes a little while to figure out what works best. Winter is the hardest for us because all I want to do is be inside and knit! 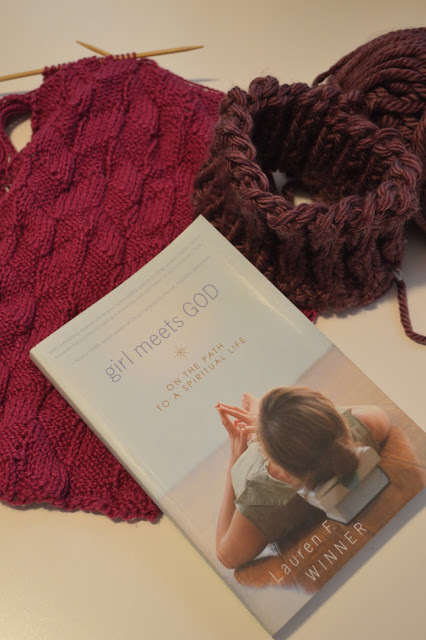 I just added Girl Meets God to my Goodreads. Thank you for the suggestion. I have always wanted to learn how to knit. I will one of these days…. I took a little break from sock knitting so that I could knit something a little quicker. I decided that I needed some new kitchen washcloths, so I am using some cotton yarn that I have in my stash to make new ones. We don’t use paper products in our home, and so rags are always needed to wipe up some spill or wash something – I do have three little kids of course! I find that my knitted washcloths stand up so much better than what I buy at the store. With that in mind, I decided some new rags would be good to have on hand. Plus, this specific cotton yarn was calling to me when I was going through my stash the other day! As far as reading goes, I am doing a lot of reading with the kids, and not so much reading for myself. 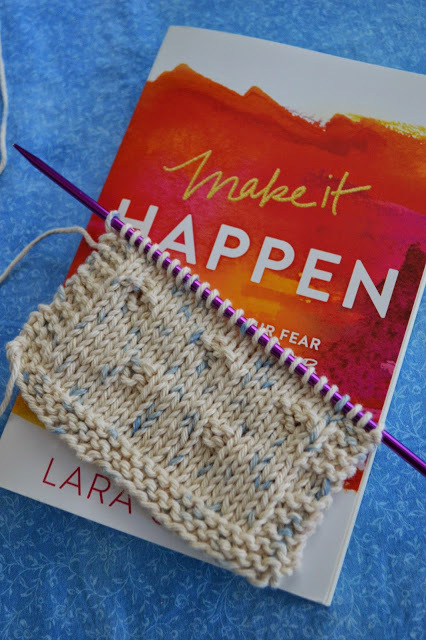 I decided to go back through Make it Happen by Lara Casey to do all the journaling questions that are in the book. It is something that I wanted to do while reading the book, but realized I needed to read the whole book before I could wrap my head around some of the thought provoking questions. I am planning on going back through several of the books that I read at the beginning of the year and had journaling questions in them. I want to continue my word of intentional for the year, and the journaling related to these books is a large part of that. What are you working on this week? Do you ever go back to books that you have read, or are you a read once and done kind of person? I really have to try to reduce our paper usage. I have never knit with cotton. Maybe I need to make some wash cloths. I really like your pattern and yarn. I'm definitely a go back and read again person. Certain books I never tire of. One thst comes to mind is the Little House series. I've lost count of how many times I've read it. I was in elementary school the first time. I'm 58 now and still love it! I do try to avoid paper products, but I'm not always successful. I don't reread books often, but I probably should. I'd really like to reread Middlemarch one of these days. I couldn't find mine to include in my post (I think it's in the car) but I also just decided I needed new cloths and cast on a really cute pattern from knitpicks- it has bobbles knit into it and it is tedious but really adorable in my red and white! I think the bobbles might be good scrubbers too! I love your blue spots in your yarn! Love your word of the year! And yes, I reread books. More often they are nonfiction ones that I am learning from, but Anne of Green Gables has my heart as far as fiction goes and I plan to reread Dickens', Great Expectations again one of these days! That's great that you're revisiting books you've already read to do the work. I subscribe to a few journaling prompt emails, and I always think I'll come back to it, and I never do. Maybe my word next year should be intentional . . .
What a great word of the year— mine was 'dare', and what a daring year it has been! I love the colour of that yarn— the hint of blue is really nice. I have a couple of favourite couple of books that I have re read a couple of times in my life. One of my favourites from my teen years that I re read every couple of years is Lord of the Rings. You have inspired me, I must make some washcloths and as I am feeling rather bored with my current WIP it seems like the perfect solution 🙂 I do like your cotton that you are using. I crochet dish/wash cloths too so much nicer than paper products. fun! homemade cotton wash clothes are so wonderful! I don't use paper products either, my small way of helping the planet. burlap sack in my kitchen. Oh, I love to re read books, they are like visiting old friends. I took a bit of a knitting break last week. It was out of necessity! I have had some very generous friends give me hand-me-downs for the new baby, and it is A LOT to go through! I’m not even sure I will be done before our new little one comes in two months. Needless to say, I am still working on the band around this beautiful hat. 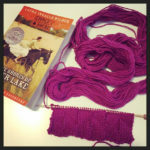 And I am also realizing that I need another skein of this beautiful purple yarn. I thought I would be able to eek out enough, but maybe my gauge is off. It will be really pretty once it is finished though…you know…if it gets finished! As far as reading goes, I just picked up the newish book by Dave Ramsey, Smart Money, Smart Kids. It is a really great read so far! I love the ideas that he has in order to teach your kids about money. There is a lot of really good information in here, and I think I am going to start incorporating that into our homeschool. It is never too early to learn about money I think, especially with the way the economy is and how expensive everything seems to be. 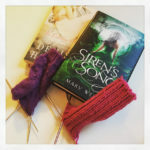 What are you knitting and/or reading this week? Joining in with Ginny, Tami, and Nicole. 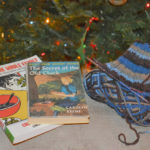 knitting reading and my big announcement! So important to teach about money at an early age, and savings. I definitely will check out this book, looks like a great one. The earlier they learn about the money the better it is for them. I hate running out of yarn! I had that happen on my last shawl and I had to cut the pattern short to make it work. Oh well….. I did not know you were expecting. Congrats! That sounds like a great book. So very true about teaching children about money. 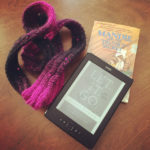 I am knitting a Menehune Shawl and reading Do Hard Things by Alex & Brett Harris. I am happy to report that I have made significant progress on Jack’s hat. Actually, I think if I could sit down for longer than a few minutes at a time, I would be able to finish it up. I do love how fast hats knit up! 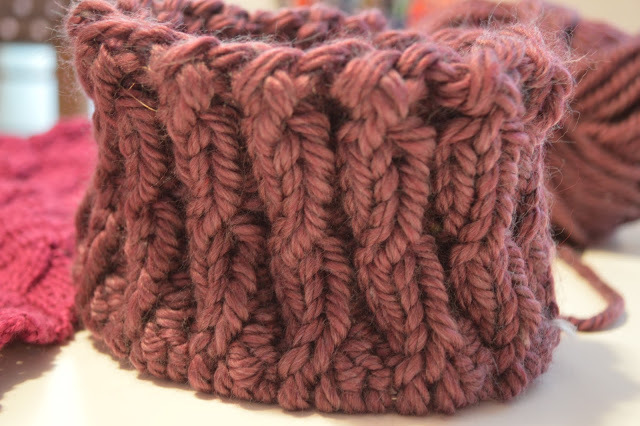 There is something very satisfying about a quick knit! I hope to finish it up this week and get working on Emma’s hat. I was also able to go up to the yarn store a couple days ago and bought some new yarn. I have not bought yarn for a long long time. Actually, I think it may have been last winter that I last bought new yarn. It was fun to take the kids and pick out what they wanted for hats and a couple other small Christmas presents. Granted, Emma wanted to buy all of those fancy textured yarns that I have trouble knitting with…but we were able to settle on sparkly yarn instead. As far as reading goes, I am looking at a lot of recipes at the moment – as I am sure a lot of people are with the Thanksgiving holiday coming next week. I also just finished a great series with the kids called Travels with Gannon and Wyatt. You can read my review here, and if you are interested, there is also a giveaway! Great Christmas gift for kids! 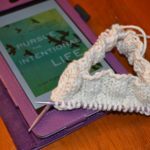 I can’t wait to see what everyone else is knitting and reading this week! The hat is looking gorgeous! New yarn is always a joy, sadly I will not be buying yarn for a very long time as my stash is now at ridiculous proportions! Love that stripey hat! I just finished one for the granddaughter but hubby mailed it off before I could get a picture. I swear I have enough yarn to last the rest of my life and some of it is over 20 years old! LOL!! 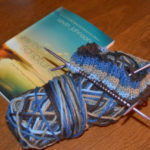 I enjoyed knitting recently with some Patons self striping too – I like your blue! I also second the Boneyard Shawl for its simplicity. I haven't gotten brave enough to try knitting hats yet. And how in the world did you go a whole year without buying yarn? Do tell. I don't think I could. I'm just starting my Christmas knitting and a red hat for my daughter is on my list. You should try the Boneyard Shawl. It is super easy and really fast. I think a lot of us are reading recipes this week. I love the sparkle in that Caron yarn. Very cool! I love the stripes! I need to get on the hat knitting myself. Thank you for the inspiration! I am definitely in a hat mood these days, and have many ideas swirling around in my head. 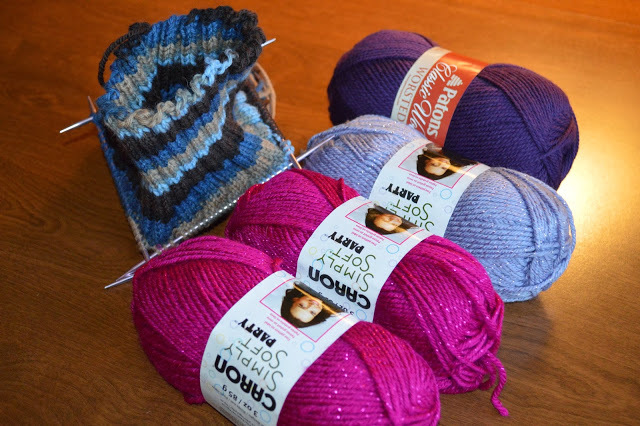 Love your stripes and glad you went yarn shopping always a mood lifter! I love knitting hats, I just wish we had more cold weather so we could wear them. I was at the yarn store yesterday for yarn and had so much fun seeing all the different kinds, although like you I don't care to knit the specialty yarns.